Until very recently we had terrible trouble finding skinless, boneless chicken thighs but lately we’ve got them in M&S, Tesco and Sainsbury’s. They are really cheap and much tastier than chicken breasts that can dry out easily. We now have a freezer full of them (just in case they become illusive again) so expect plenty more ideas for chicken thighs here over the next while. All this dish requires is minimal chopping, bung it all in the one pan and bake – perfect for a weeknight (and it’s really healthy too!). Heat the oven to 200C/180F/gas 6. 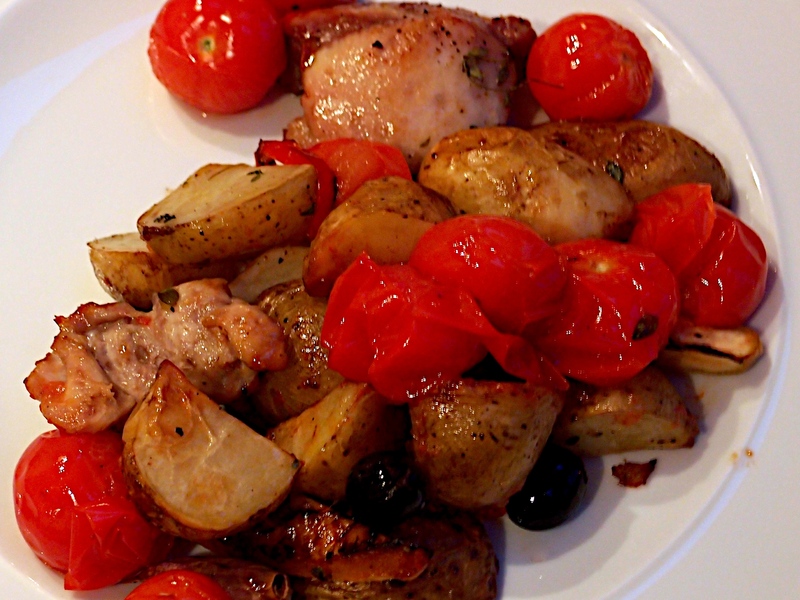 Put the chicken, potatoes, lemon, garlic, pepper and thyme onto a large baking tray. Drizzle the oil over and season. Then roast for 30 minutes. Add the olives and tomatoes and roast for another 10 minutes or until the chicken and potatoes are browned and cooked through. We served this with a rocket salad.